Learn to dance all the fabulous Ballroom & Latin dances as seen on TV! Enjoy expert dance tuition by Dance Passion, our brand new absolute beginners Strictly Dancing course will be teaching you a fabulous selection of the world’s most popular Ballroom & Latin dances, including the Waltz, Cha Cha, Jive, Foxtrot, Rumba, Quickstep, samba, Tango and Salsa. We regularly hold beginners/intermediate courses in Walton. Classes run regularly every week. Payment can be made as drop in or half termly. The simply cha-cha, is the name of a dance of Cuban origin. It is cheeky and flirtacious with lots of hip action! Jive is a dance and is the faster version of the swing. A lot of kicks are used in jive with a bouncy type movement using the balls of the feet a lot. The dance of luuuurve… the rumba is the most sensual and romantic of the Latin dances. If you’re learning this, take along an appropriate dance partner! Tango music and its associated dance forms originated in Argentina and Uruguay. It’s a passionate dance and staccato in style, with definite, sharp movement and lots of drama. Think of the mesmerising and storytelling tango danced in Moulin Rouge to The Police song Roxanne mixed with the tango classic Tanguera. From the old German word ‘walzen’ – to roll, turn, or to glide – the waltz is a smooth and elegant dance where partners move as one. Professional waltz couples wear flowing ball gowns for the women, and tails for the men. The Samba originated in Brazil where it is danced as a party dance during the street festivals and celebrations. The festive style and fun mood of the dance make it one you can use to impress on any dancefloor. The Quickstep evolved in the 1920s from a combination of dances including the Foxtrot, Charleston, Peabody, and One Step. It should be a light, bright dance with fast footwork. A good quickstep involves a lot of work on the balls of the feet and plenty of spring. The Paso is based on the bullfight, the man representing the bullfighter, ‘Torero’, and the lady the red cape or ‘cappa’. It’s also the dance where John Sergeant dragged his partner along the floor like a sack of spuds, but don’t let that put you off. 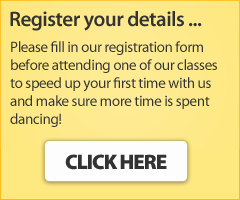 Need some confidence before attending our group classes? We offer one to one lessons to our clients based in our brand new studio in Walton. Sign up for both private and group lessons and receive a 25% discount. I’ve never danced before so which class is suitable for me? All our classes have a description for the level which is suitable to that particular class. We offer classes designed for beginners which run every 7/8 weeks. These are perfect for the absolute beginners so don’t worry we’ll be teaching you throughout the lesson, one step at a time. All our classes have a description for the level which is suitable to that particular class. We offer classes designed for beginners which run every 3 months. These are perfect for the absolute beginners so don’t worry we’ll be teaching you throughout the lesson, one step at a time. Something comfortable, flat shoes preferably not trainers. No. If you join as a group of friends, we may ask you to partner each other up – this way it’s more fun for you all & you can practice with each other when you’re out & about! Or you can learn the man or ladys steps on your own. How long does the class go on for? Yes, you’ll need to reserve your place & make full payment on the first lesson. 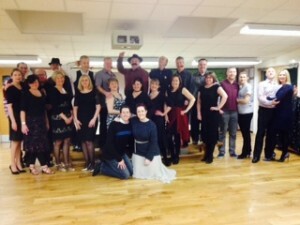 I’ve attended the Latin/Ballroom class (Tuesday) for a couple of years now. It is so much fun and it’s run by the loveliest, friendliest people ever. You are made to feel so welcome, like you are part of a family. The music is great and you learn to dance too – Salsa, Samba, Cha Cha, Jive, Waltz, Quickstep etc. I’m thinking of trying the Zumba class soon. So if you want fun, friendship and exercise, come to Dance Passion. My wife and I have attended Argentine Tango, Waltz, Jive and Quickstep classes. I have a very sedentary job and going dancing gets me off my feet and moving. It’s challenging too: and it provides a perfect break away from the stresses and strains of everyday life. You can’t afford to think about work when you’re trying to get your steps right! 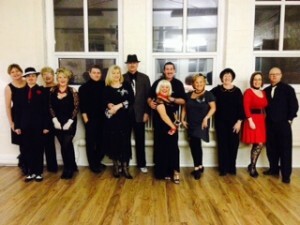 The staff at Dance Passion are tremendously supportive and the people who attend are extremely friendly, so much so that we attended a professional dinner dance together, which was tremendous fun. We’ve also encouraged my mother and father-in-law to come, but I’d recommend Dance Passion to anyone.